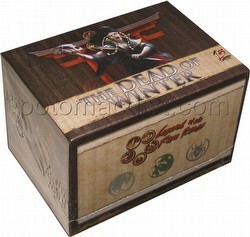 Each $27 box contains 6 decks. Each deck contains 84 cards. Dead of Winter is a 166-card expansion for the Legend of the Five Rings CCG. Each starter box includes 2 copies of three different decks: Crane, Mantis, and Spider. As the icy grip of winter holds sway over Rokugan, the wars that plague its people grind to a halt. For even the inhuman Destroyers cannot stand against the fury of the elements. Although the dead of winter grips the Empire, in the distant ruins of the Ivory Kingdoms, the elements spare their fury, allowing the Mantis to get a foothold firmly established, in an attempt to discover the truth about the origin of the Destroyers.